May 8 (Bloomberg) Talks with Rio Tinto Group to approve the stalled $5.4 billion stage two of the Oyu Tolgoi copper mine could wrap up as soon as next week, according to Mongolian Prime Minister Saikhanbileg Chimed. A Rio delegation is due in the country by next week and "I hope by this time we will finalize all ongoing issues because the principle agreements are already there," Saikhanbileg said in an interview Thursday with Bloomberg TV Mongolia in Ulaanbaatar. "We need to go through small technical issues, some procedural steps." Rio and the Mongolian government have been locked in talks over a raft of issues related to the copper mine for two years. The focus has been how to fund a $5.4 billion underground expansion of the mine to accompany the open pit operation that went into production in 2013. Negotiations with the Mongolian government are continuing, Rio Chief Executive Officer Sam Walsh said Thursday at the company's annual general meeting in Perth. "We are narrowing down on the issues and I am hopeful that at the appropriate time for all involved that we will be able to bring that project into the board," said Walsh, who visited the mine in March. "We don't want to rush anything just for the sake of doing a deal because it has to be sustainable. It has to stand the test of time and that is seriously important," he added. Turquoise Hill Resources Ltd., which owns 66 percent of Oyu Tolgoi LLC, has seen its shares soar 44 percent in New York since the start of April amid speculation that a deal is close. Rio controls the project through its 51 percent stake in Turquoise Hill. Mongolia, which has a 34 percent stake in the mine, has seen investment into the country plummet over the course of the dispute, with inbound foreign direct investment falling from $4.45 billion in 2012 to just $508 million last year. "When moving and when making solutions on this project, I think big impacts will definitely change the overall picture of Mongolian development and Mongolian economy," said Saikhanbileg. May 10 (FT) Global copper prices will recover faster than expected with demand outstripping supply within two years rather than the three to four years previously predicted, according to Rio Tinto. The bullish forecast comes as the Anglo-Australian miner steps up talks this week with the Mongolian government aimed at finalising a deal on a $6bn expansion at the Oyu Tolgoi copper mine. Jean-Sébastien Jacques, Rio Tinto's head of copper and chairman of the International Copper Association, said decisions by industry to slow copper production in response to weak prices meant the market could become balanced this year. "It was expected to be oversupplied but because of disruption in the marketplace and because of decisions made by the industry to slow down some projects we could face a situation where the market is balanced this year," he told the Financial Times in an interview. "If you had asked me the question in December last year I would have said the inflection point would be three or four years down the road and today it is likely to be 18-24 months down the road," he added. Copper hit a five-month high of $6,479 a tonne last week after rising for nine straight days before slipping to end the week at $6,388. That is up 18 per cent from January, when hedge funds in China pushed the price down to five-year lows. Mr Jacques will hold talks with investors about the changing market dynamic over coming weeks, which could unlock funding and investment for copper projects still on the drawing board. Rio's more optimistic view of the copper market may help explain a quickening of its negotiations with the Mongolian government over the expansion of the $6bn underground portion of the Oyu Tolgoi mine in the Gobi desert, which had been stalled for months. A Rio delegation is due to visit Mongolia this week for talks aimed at resolving a two-year dispute with government over taxes and cost overruns during the first construction phase. The stand off between the two parties has undermined foreign investors' confidence in investing in the resource rich country. In April, Mongolia's prime minister Saikhanbileg Chimed said on national television that Rio and Mongolia had reached an agreement in principle on developing the $6bn underground portion of the Oyu Tolgoi mine. Mr Jacques said he was optimistic a deal would be achieved to develop the mine, although the timeframe remained difficult to predict as it was as much a political as a business negotiation. He said the principles of the value sharing agreement signed five years ago with the Mongolian government with 53 per cent of economic benefits flowing to the government remained in place. Mr Jacques said Rio has kept the consortium of 15 banks involved in financing the expansion informed about developments and he was optimistic this could be put in place in weeks or months. "I am pretty optimistic. It will happen," he said. During a visit to the mine in March, Rio Tinto chief executive Sam Walsh reiterated Rio Tinto's "best and final offer" for the second phase of Oyu Tolgoi presented to the Mongolian government in late last year -- an offer that the prime minister said included unpalatable fees for the mine operator. May 9 (Sydney Morning Herald) Rio Tinto's copper boss Jean Sebastien Jacques believes the outlook for the red metal has improved significantly in just six months, with a long-awaited shortage of supply set to emerge up to two years earlier than previously thought. Speaking in Perth this week, Mr Jacques declared parts of his market appraisal last December – where he predicted a shortage of copper would not emerge until 2018 or 2019 – were out of date already. The first three months of 2015 saw supply from some of the world's largest copper mines interrupted, with mechanical failures cutting output from Olympic Dam in February while heavy rains affected operations at several large mines in Chile. Mr Jacques said those disruptions combined with slightly better than expected demand for copper would likely ensure that the predicted surplus of copper in 2015 would not emerge. "I can see the light at the end of the tunnel in the next 12 to 18 to 24 months," he said. "In December I said it would take three or four years to see the inflection point, but by 18 or 24 months we could start to see some interesting price back into the system. "I believe the market will be balanced this year." While iron ore still dominates Rio's balance sheet, copper dominates the company's future planning, with exploration and appraisal work mostly focused on copper deposits. The same is true at BHP Billiton, with chief executive Andrew Mackenzie reiterating this week that his company's investment was most likely to focus on copper, oil and potash assets. Rio's copper development pipeline includes the second stage of Oyu Tolgoi in Mongolia, the high-grade Resolution joint venture with BHP in the US, and longer term the large but lower-grade La Granja deposit in Peru. Mr Jacques said the expansion of Oyu Tolgoi remained the first priority of those three assets, and he said talks to resolve differences with the Mongolian government were now down to a small number of issues. Copper prices fell by about 30 per cent during December and January, but have since regained most of those losses and the conductive metal was fetching about $US2.90 per pound on Friday. Deutsche Bank agrees that 2017 is likely to be the year in which copper rises from its slumber; the investment bank predicts average copper prices below $US2.80 per pound in 2015 and 2016, but for the price to average $US3.17 per pound in 2017. Rio's copper division was recently merged with the coal division to cut costs, leaving Mr Jacques managing a portfolio with assets in Asia, North America, South America, Australia and Africa. Copper and coal are quite different commodities, particularly in the downstream area where copper requires much greater extraction and separation from its host rock than does coal. But Mr Jacques said there were sufficient similarities for value to be created by combining the two divisions into one, particularly by challenging the different teams to perform better than each other. "An open-pit copper mine and an open pit for coal are pretty close to the same ... shovels, trucks, the same," he said. "There is lots of benchmarking that is taking place between the two parts of the business, both in terms of cost, productivity and safety. The coal business was much more advanced in terms of cost, productivity and asset utilisation compared to copper, but copper was more advanced in terms of safety culture, especially underground. "There will be lots of sharing of practices and we will be able to create value on the back of those two businesses together," he said. TORONTO, ONTARIO--(Marketwired - May 8, 2015) - Khan Resources Inc. ("Khan" or the "Company") (CSE:KRI) announces that it has posted on its website (www.khanresources.com) the Award on the Merits rendered in favour of Khan by the international arbitration tribunal on March 2, 2015. The Company has also posted on its website the Decision on Jurisdiction also rendered in favour of Khan by the same Tribunal on July 25, 2012. The members of the Tribunal were unanimous in both of the decisions. Mr. Grant Edey, President and CEO of Khan, commented, "The Award on the Merits and the Decision on Jurisdiction are published to add transparency on this issue to our shareholders. The Tribunal in the Award decision has agreed with the Company's presentation of the facts and that the Company did not break any laws as frivolously alleged by the Respondents as their only defense to their own illegal actions. The Tribunal affirms that the Mongolian Government broke its own Foreign Investment Law in relation to the expropriation of the Company's Mining and Exploration Licenses and therefore also breached their obligations under the Energy Charter Treaty to which Mongolia is a signatory." The Award on the Merits asserts that the Government of Mongolia did not comport with Mongolian Law or the Rule of Law. The Tribunal accepted Khan's argument that the Government of Mongolia had no valid legal basis to invalidate Khan's licenses and only did so because of its desire to operate the Dornod project in partnership with Russia (through its state owned enterprises Rosatom and Atomredmetzoloto). The Tribunal found that the evidence provided by Khan, and in particular, the timing of various inspections, reports and invalidation notices, indicate that the Government was in fact motivated by the prospect of developing the Dornod project at greater profit with a Russian partner. In the 94 page well-reasoned Decision on Jurisdiction, the Tribunal succinctly concludes "for all of the reasons stated above, and rejecting all contentions to the contrary, the Tribunal: (a) DISMISSES all of the Respondents' objections to jurisdiction, and (b) FINDS jurisdiction over all the Claimants' (i.e. Khan) claims under the Founding Agreement and the Energy Charter Treaty." The strength, clarity and forcefulness of these decisions reinforce Khan's determination to obtain value for its shareholders from the illegal expropriation of its licenses. May 8 (Globe and Mail) For Jim Doak, the proverbial glass was never half-full or half-empty. Rather, it was filled to the brim at all times, even when he encountered obstacles. "Patsy, I'm just going to drive on," he was wont to say to his long-time partner, Patricia Best. An irrepressible optimist who parlayed a love for literature, languages, people and numbers into successful careers on Bay Street as an investment analyst, hedge fund manager and business commentator, he believed that as long as he kept moving and looking forward, things would get better. And the sheer force of his character usually made that come true. "His optimism was a real gift," Ms. Best said. "Jim was a gentleman, generous, classy and fun. He believed in the best in everybody and gave people the benefit of the doubt long after others would give in. He gave his time and he was always pulling out his wallet to buy lunch or charity tickets or cookies from the neighbour's grandson who was selling them to raise money for something or another." Larger than life, with an omnipresent grin and a penchant for opera, folk music and anything by Cher, Mr. Doak sent his family and colleagues reeling when he died suddenly on April 22 in Ulan Bator, Mongolia. Mr. Doak, the chairman of Khan Resources Inc., was there with his colleague Grant Edey, the president and CEO. The small uranium exploration and development company had been at the centre of a long legal battle ever since the Mongolian government cancelled its uranium licence in 2009 and expropriated property it had planned to develop as a mine. An international arbitration panel ruled in March that the government should pay Khan more than $100-million (U.S.) in compensation for its losses, and the brief trip began as a hard-hitting bid to collect payment. Instead, after the two men wound up negotiations on the morning of April 22, it turned tragic when Mr. Doak fell ill during lunch at the hotel and retired to his room to rest before their flight home. When Mr. Edey couldn't raise his friend on the phone, he had hotel staff open the door. An autopsy performed in Toronto declared his death to be from natural causes related to the late-onset Type 1 diabetes Mr. Doak had been diagnosed with in his 20s. He was 59 years old. "It's unreal," said Mr. Edey, who accompanied the body back to Canada. "He was a man who would weigh into any subject and he'd up his points with quotes from sources that range from the Romans, the Bible, prime ministers and philosophers. He was never at a loss for an answer and he was never at a loss for words." Mr. Doak mischievously displayed his knowledge in an e-mail earlier this year to a firm of American lawyers representing Khan with a postscript to two of them who had been unable to attend the company's Christmas party in Toronto, referring to a comment British Major-General Sir Isaac Brock reportedly made as he led his regiments up Queenston Heights in the dark during the war of 1812 to repel American invaders: "Where are the damned Americans?" The e-mail continued, "I hope after the tribunal's decision, you can quote your Commodore [Matthew] Perry from the same war – 'We have met the enemy and he is ours.'" James Basil Charles Doak was born in Montreal on Sept. 10, 1955, the youngest of Kenneth and Barbara Doak's four children. His father was a high school science teacher and his mother was a homemaker; the family lived in a comfortable home in Saint-Lambert, a Quebec town on the other side of the St. Lawrence River, one of several communities that make up what is known as the South Shore. The family revelled in books, sports and music. Young Jim and his two older brothers and sister sometimes rode their bicycles down to the riverbank and jumped in, despite their parents' strictest instructions not to do so. He was a proud Boy Scout with multiple badges, and a good student who was part of the province's first French immersion school program in the 1970s – an experience that left him perfectly bilingual and in love with French culture. Along with Ms. Best, his children and stepdaughter, Mr. Doak leaves his three siblings. May 8 (Mongolian Economy) A working group has been established to make conclusions on discussions by the Parliament on measures to be taken for the development of the Tavan Tolgoi coal deposit investment agreement. We have talked with the head of the working group, MP L.Erdenechimeg, about the working group's progress. - It's been five days since parliament established the Tavan Tolgoi working group. How is your work process going? -The main working group has assembled once and has given particular tasks to the sub-group. They must prepare and collect all documents and materials in accordance with the 14 articles in the guiding document. The sub-group is working hard to collect the materials from relevant departments. Right this moment, they're still in a meeting. Currently, we have sent official letters to six state institutions such as the Cabinet Secretariat of the Government of Mongolia, the Ministry of Transportation and the Mongolian Railway JSC. We requested several important financial documents from these organisations, because after analysing the 2014 report by the Mongolian Mining Corporation, which has been selected as the Tavan Tolgoi project investor, the company has USD 23 million in debts. For example, this company has debts to the Netherlands' FMO and Germany's DEG banks, and they have also issued USD 600 million in bonds. They have to pay the debts by the 15th of this month and finish paying the bonds by 2017. In addition, this company has used Energy Resource's power plant, water facilities and coal washing plant in Ukhaa Khudag for these banks as loan collateral. They have put all the shares of its integrated companies as collateral for the USD 600 million in bonds. It means that this company selected as the investor of the Tavan Tolgoi project has pledged everything. Therefore, it should be pondered whether it's correct to give 51 percent of shares representing Mongolia to a company with such large debts. It's our first conclusion of our work. Thus, we demanded that we be provided with the last three months' worth of financial documents from the MMC. We requested that the government bring major foreign financial consultation in order to monitor the company's financial ability to implement the project and draw a conclusion based on this. We are ready to give our assessment as soon as the government gives a response to our requests. - Does this mean that the government didn't get any information on this company in the past? - Certainly. Tavan Tolgoi issues have not been submitted to parliament in the past three years. The working group that I'm currently heading has received the first documents on Tavan tolgoi just 15 days ago. I have almost become the person who has most information on this among the 76 members of parliament (Mogi: LOL), but even so, I have only just received my first bits and pieces of information on Tavan Tolgoi. There are many things the other members of parliament don't know about Tavan Tolgoi. Therefore, it is necessary that everything be thoroughly examined. The agreement can't be continued in its current form. - Have you and the working group went over the general agreement? -The head of the working sub-group, A.Gansukh, had reviewed the general agreement before it was finalised. Now it's necessary to examine whether it's still the same as before. So, you can say that the agreement has been fully reviewed. - It's said that MNT 2,000 will be given to shareholding citizens per year according to the current terms of investment agreement. Is it true that there are such provisions? -This huge deposit has 6.5 billion tonnes of reserves, but the current agreement has allocated 98 percent of its shares to companies and has only allocated only two percent to the state (Mogi: huh?). The two percent will give USD 25 million to Mongolia per year. If divide this into 2.1 million citizens of Mongolia, it would be MNT 2,000 per person annually. The Prime Minister is saying, "We will sign this agreement, and get USD 500 thousand in advance." However, according to the contract, the state will get USD 200 million in advance from companies' royalty fees to be paid in the future with an annual interest rate of 4.5 percent. Hence, this project agreement is not possible to be resumed in its current form. - How many of the members of parliament are actually willing to resolve the Tavan Tolgoi issue? - The Speaker of the Parliament was able to stop the agreement which was going to be signed directly without being submitted to the parliament. The purpose of discussing it in parliament is to give open information to the public. We should discuss this agreement in parliament and protect citizens' right and interests. May 8 (news.mn) The utilization of water resources from Balgas Lake for activities at the Tavan Tolgoi deposit have been indicated in the Tavan Tolgoi agreement, permanent residents of the area are protesting the use of these resources. Representatives of herders from the area met today with Advisor of the Speaker of Parliament A.Gansukh. The residents say that utilization of pure water resources from the western region of Umnugobi aimag for mining production will threaten the way of life for local residents and that a deficiency of water resources will be created in these aimags. During the meeting local residents said that they are disappointed that the utilization of water resources hasn't been clearly and precisely indicated at the Tavan Tolgoi and Oyu Tolgoi agreements which are being established. Ulaanbaatar, May 8 (MONTSAME) At the Stock Exchange trades on Friday, a total of 36 thousand and 573 units of 21 JSCs were traded costing MNT 13 million 788 thousand and 932.00. 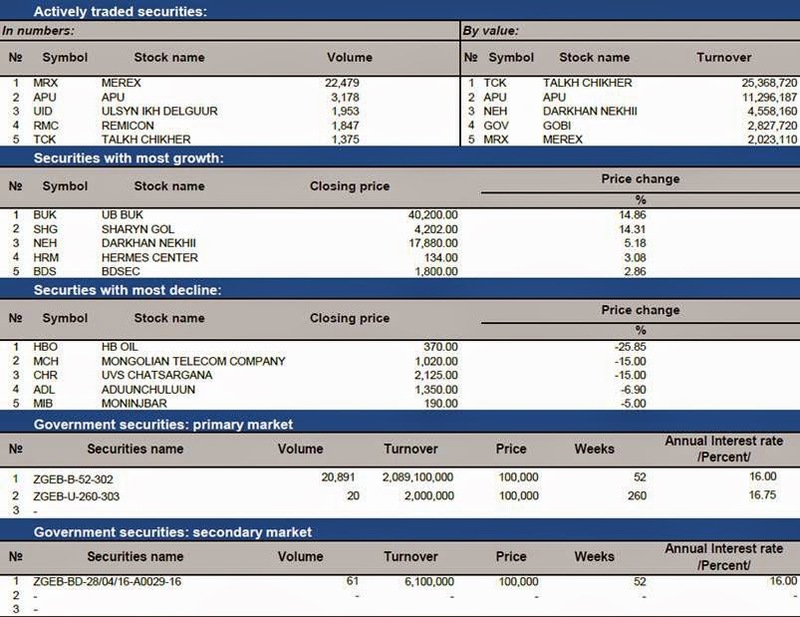 "Merex" /33 thousand and 015 units/, "APU" /2,360 units/, "Hai Bi Oil" /480 units/, "Bishrelt industrial" /114 units/ and "State Department Store" /114 units/ were the most actively traded in terms of trading volume, in terms of trading value were "APU" (MNT eight million 256 thousand and 180), "Merex" (MNT two million 938 thousand and 335), "Atar-Orgoo" (MNT 680 thousand), "Talkh chikher" (MNT 630 thousand), "Bulgan guril tejeel" (MNT 209 thousand). The total market capitalization was set at MNT one trillion 263 billion 645 million 423 thousand and 084. 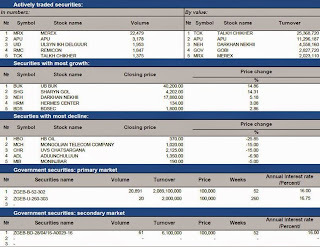 The Index of Top-20 JSCs was 12,881.19, decreasing 1.00% and the all index of MSE was 943.63, decreasing 0.60% against the previous day. May 8 (news.mn) The purpose of the agricultural stock exchange market is organize open, transparent and fair trading of shares following to the relevant legal acts and laws of the Commercial Department of the Agricultural Stock Exchange market, to promptly provide fair and correct information to the traders and public, to do research and study basing on the trading information and to aim to sophisticate further activity of the Trading Department of the Mongolian Agricultural Stock Exchange. We are providing information regarding the trading of several important raw materials at the Agricultural Stock Exchange Market of Mongolia this week. This week the Agricultural Stock Exchange Market has traded 571.9 tones of cashmere, 374.7 tons of sheep wool, 23.9 tons of goat wool and in total trading of 33.1 billion MNT has been carried. May 8 (gogo.mn) Cabinet submitted the State Great Khural Resolution on approval of the Socio-Economic Development Guidelines for 2016 to the State Great Khural on April 30th. The document is being discussed by the parliament currently. Introduction was done by the Head of the Government Office S.Bayartsogt. MP A.Tleikhan made introduction of the Economic Standing Committee Report. Cabinet forecasts economic growth in next year to be at 5 percent, while in 2014 Mongolian economy had growth at 7 percent. Also the cabinet foresees to have the inflation within single digit number. As of March 2015 the inflation rate was at 9.3 percent. The document also provisions the establishment of the Planning Unit under the GoM. According to the assessments of the GoM the GDP per capita is at USD 4400, unemployment rate is at 7 percent. The same number was at 7.7 percent in 2014. According to the introduction by S.Bayartsogt, the financing amount to be at MNT 3 trillion from the state budget and MNT 3 trillion in the result of the PPP. IMF has warned the government of having weak state budget and monetary policy. Moreover, MPs have warned to take this recommendation into consideration and proposed not to raise the Government debt further. MP R.Amarjargal said: "Government is neglecting the numbers when submitting the documents for approval of the Economic Development guidelines. How much the BoM is accountable? The current management of BoM has led to the current economic difficulties. Speaker of the State Great Khural is defending the BoM. It is time for them to accountable for their actions." While S.Bayartsogt denied any participation of BoM in developing the Economic Development Guidelines for 2016 document as the Ministry of Finance done all the detailed assessments and those have been discussed by the expanded session of the National Security Council and is to be introduced by PM next Friday. Moreover, he assured that the document depicts the goals of both DP and MPP. Ulaanbaatar, May 8 (MONTSAME) The Basic Guidelines Economic and Social Development for 2016 was approved by the State Great Khural at the afternoon plenary session, May 8. At the plenary meeting Friday morning, the Parliament ran a voting on discussing the adoption of the draft Basic Guidelines of Economic and Social Development for 2016. Due to a majority approval the draft was transferred to the affiliated Standing committee to be prepared for its first reading. Although the discussion of the draft received many criticisms, it was approved by majority. The parliament is currently running the readings of draft new wordings of the laws on Accounting and Audit, and other draft laws. 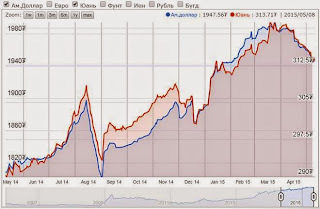 May 8 (infomongolia.com) In February 2015, Prime Ministers of Mongolia and Japan, Ch.Saikhanbileg and Shinzo Abe signed the Economic Partnership Agreement (EPA) in Tokyo, which is the first EPA for Mongolia and the 15th for Japan. Under the document, parties agreed to mutually free wholly and partially some products and goods from customs duties that will take up to 10 years of implementation as soon as the EPA goes into effect. Accordingly, about 5,700 Mongolia's major products and goods are able to enter the Japanese market and contrary, 9,300 items from Japan to Mongolia that would significantly to help businessmen of the two countries. 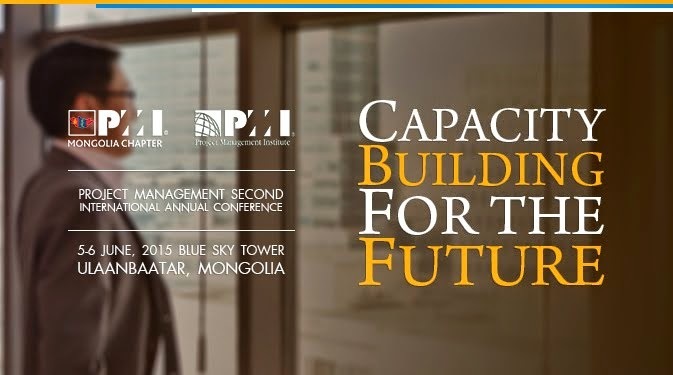 In the frameworks to support businesses and entities, Mongolian National Chamber of Commerce and Industry is organizing a meeting aims to link private sectors of the two parties and the event to take place at the MNCCI building at 10:00 am on May 13, 2015 will be attended by Minister of Industry D.Erdenebat. In this meeting, Mongolian entrepreneurs will be got acquainted with opportunities what products and goods can be exported and supplied as well as to introduce own advantages and competitiveness ability on Japanese market. Aftermath, Mongolia-Japan 7th Consultative Meeting to gather public and private sectors is planned to organize in Tokyo in the end of June of this year. Ulaanbaatar, Mongolia, May 8 (Al Jazeera) - The cashmere industry is Mongolia's second-highest money earner when it comes to exports. May 8 (Skift.com) Berlin is often considered the hedonistic capital of the world and has made headlines in recent years as a magnet for young artists, musicians, freelancers and partiers. Despite its reputation, however, the majority of tourists to Berlin are actually successful entrepreneurs looking for a weekend of culture, fun and relaxation. "The average age of a tourist in Berlin is 41 years old," explains VisitBerlin CEO Bernhard Kieker in a recent interview. This group of travelers is usually successful in their profession and making money. They are looking for a high-end city destination and staying in 4- or 5-star hotels. "We offer wellness for the body and soul. Soul is culture," says Kieker. Although "easyJet" tourists going to clubs and drinking beer in the streets are the most talked about tourists when it comes to Berlin's rise as global destination, they only account for about 15 percent of total visitation. A total 11.9 million visitors arrived in Berlin in 2014, of which 7.4 million came from Germany. Europe is, of course, its largest international market with visitors coming from the UK, Italy and the Netherlands. However, an unexpected market for Berlin is Mongolia. According to Kieker, many of the Mongolians that study abroad come to Germany. "I think we're the only city worldwide that does marketing in Mongolia," he says. "It's always great fun and we make a lot of money in return." Ulaanbaatar, May 8 (MONTSAME) A new state-owned kindergarten has opened in the 28th khoroo (smallest administrative unit in Ulaanbaatar) of Bayanzurkh district. An opening ceremony of the new kindergarten took place Friday with participation of N.Bataa, a Deputy Mayor of Ulaanbaatar city; Ts.Batkhuu, head of the Citizens' Representative Khural of Bayanzurkh; D.Purevdavaa, governor of the district; deputy governors of the district and other officials. Constructed by the "Ezo house" company, the new #203 kindergarten will involve 150-200 pupils living in the 28th khoroo called "Khujirbulan". In the academic years between 2013 and 2015, the district had six state-run kindergartens and 26 private sectors. The number of kindergarten pupils increased by 2,126. May 8 (Mongolian Economy) Five years ago, CNN ranked Mongolian as the 4th coolest nationality on earth. When describing "cool" Mongolians, journalist Barry Neild said: "Along with a carefully crafted air of quiet mystery, these unflappable souls pretty much perfected the freewheeling, nomadic cowboy existence, throat singing and yurts. Fur-lined everything—boots, coats, hats, undies—adds hearty splendor to the historic mystique. And who else keeps eagles as pets?" Unfortunately, one of the world's coolest nations ranked 131st out of 140 countries in a tourism report by the World Economic Forum. It received a score 5.49 out of 7 for its friendliness towards visitors. It seems almost daily now that newspapers and broadcasters report about Mongolia's unfriendly tourism destinations. Some even say in their reports; If you're hoping for friendly locals, don't come here. No one wants to have their vacation ruined by rude locals. Are Mongolians really this unfriendly? Relatively few people take nationalistic actions against foreigners. But with reputations, a few bad apples ruin the whole bunch. To combat the reputation before it gets worse, some Mongolians are taking action. The 'Hospitable Ulaanbaatar' campaign was given the final tick of approval by the City Council last September. It seems like a big step to redesign some of the city's bad images. 'Nairsag UB' is social campaign launched by the Ulaanbaatar city Tourism department. The campaign encouraged Ulaanbaatar residents to smile more and to be more polite when facing tourists. Nairsag means hospitable and friendly in Mongolian. The campaign's main goals are to enhance local residents' awareness towards tourism and to form a tourist-friendly atmosphere. 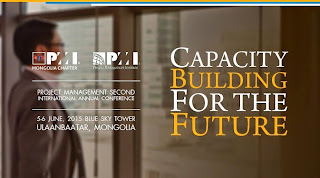 The plan is based on the general development Master Plan of Ulaanbaatar city until 2020. In a development tendency document that plans further toward 2030, the 'Hospitable Ulaanbaatar' campaign aims to make the capital a business tourism center of North-East Asia, and a cultural tourism hub of Mongol nationalities. Ulaanbaatar's campaign seeks to attract two million tourists by 2020 and five million by 2030. Currently, Mongolia hosts at most 500,000 tourists a year. They pass through the city before and after travelling across Mongolia. Ulaanbaatar Mayor E.Bat-Uul's recent apology to foreigners shows why there is need to dress down the city for not being harmonic. Ulaanbaatar Mayor E.Bat-Uul met with delegates of the Association of Inner Mongolians in Mongolia a few weeks ago and offered his apology for an attack against Inner Mongolian tourists by members of a Mongolian nationalist group. Photos of the foreign visitors kneeling in front of members of a Mongolian nationalist group at landmark Burkhan Khaldun Mountain had been circulating on social media two weeks prior to the Mayor's statement. But Bat-Uul can't just come out and apologize every time some Mongolians scare foreigners. If apologies mean so little, the reputation of Mongolia and Mongolians will fall. That is the outcome for the next time. The 'Hospitable Ulaanbaatar' campaign is there to lead Ulaanbaatarians to clear the city's name and that of society. Behind the campaign, the service sector stands foremost, and has begun taking action in their activities. There are already completed reports about tourist police implementation; vocational training on ethics and English language classes were organized for patrol officers and other service sector employees. The Ulaanbaatar City Tourism Board and Metropolitan Police Department are organizing several programmes to enhance tourist safety, prevent and protect tourists from possible crimes, and provide convenient travel conditions. Just few days ago, an international expo and competition for hotels, restaurants and catering was held here. Through all these, the capital aims to be a friendly and safe city for tourists. The campaign-which will be conducted in three phases, has two years per phase. Almost 60 percent of all conducting works should be completed in the first two phases, and the rest will fit in the last two years of campaign. The city council intends to get more participation from the private sector in the campaign's implementation, which they believe is the most efficient way to reach their goal. Clear outcomes should be seen by the campaign's 2020 deadline. What results can we expect? According to the city council's approved resolution for the campaign, there are certain measures to scale implementation outcomes of the campaign. The campaign will increase tourism numbers to the aforementioned, increase tourism's contribution to the overall economy of city by 20 percent from current the 9.8 percent, and create 35,000 new jobs. The tourism 'leakage effect' should decrease by 30 percent at least, while crime per 100,000 tourists should drop threefold. Without these results by 2020, the Hospital Ulaanbaatar Campaign will have been a waste of time and money. To make Ulaanbaatar city friendly, the city council is budgeting five percent of total city budget every year, or about MNT 35 billion. Increased investment and promotion is expected to raise GDP by 2.5 times, or USD five billion, by 2030 according to Hospitable Ulaanbaatar Campaign. For this year, city council budgeted 4.6 billion, less than five percent, to be used to complete 44 initiatives. Ts. Enkhtsengel, Deputy Mayor of Ulaanbaatar, explains that the low figure is a result of the campaigns infancy. In Ulaanbaatar, there are many new shiny projects under construction, from new restaurants and hotels to other service accommodations, which is good thing. But a lack of customers would be a huge problem on the financial side. For the service sector, tourism is a big part of their profit. Data from the Ulaanbaatar tourism department says a tourist in Mongolia spends on average USD 190 per day. Service sector entities can't count on just purchases from locals, because it's not really enough to build strong performance and expand. More tourists in Mongolia means better profit for most service sector entities. In some ways, selling products to an increased number of tourists is an easier, more direct process than exporting. "The service sector contributes 60 percent of total city GDP. If service sector profit increases, state and city tax income will rise, and financing of the Hospitable Ulaanbaatar campaign will come back through the increased sum of tax revenue," says, Ts. Enkhtsengel, Deputy Mayor of Ulaanbaatar city in charge of social development. This year, there are 32 public events in the framework of the campaign. The schedules of the events are already distributed to relevant tourism units. The events are planned to be held regularly every year. The 32 events had to meet certain criteria—such as their likelihood of attracting tourists, benefits to promote domestic purchases, and increase in profits for the service sector. Currently, almost 70-80 percent of all tourists visiting Mongolia come in July specifically for Naadam. The organising of other big scale cultural events could break up the one event-led mass of tourists, as it would give more options to see in Mongolia. Furthermore it would help tourism companies to operate for four seasons when events are scheduled all year around. The Hospitable Ulaanbaatar Campaign is a plan to make both tourists and Ulaanbaatarians smile. If capital residents don't smile much and behave politely, the campaign won't be as effective. Are there any benefits to being unfriendly? If we analyze the effects of being friendly, there are far more economic and social benefits that can be seen. If the campaign succeeds, Mongolia could come up on the list of world friendliest countries. Friendly sounds pretty cool, doesn't it? May 7 (UB Post) A large complex for national festivals and celebrations is expected to be built at Khui Doloon Khudag by 2020. The construction work of the complex started in 2013. As Mongolia is planning to host the 2040 Summer Olympics, several construction works are to be erected in relation to its preparation. A cycling and travel program named Healthy Citizen – Eco Development of the Mongol Naadam Complex has started for the second year. In a geminated count, more than 3,000 young people participated in the cycling program last year in Khui Doloon Khudag. This year, the program's organizers are working with the plan to increase the number of participants. The horse racing field, archery field, basketball field, camps and sand areas have been included in the program this year. Khui Doloon Khudag will be crowded with many children on May 30 and 31, as the Mongol Naadam Complex is planning to host the Children's Day at the fields. The Mongol Naadam Complex team is working hard to provide children and parents with a comfortable environment and interesting activities. Competitions in cycling, basketball, archery and wrestling will take place among children on May 30 and 31 at Khui Doloon Khudag. A meeting of dog owners will also be held at the field on Children's Day. Buddhism is deeply rooted in the Mongolian tradition and heritage, as it has been around in Mongolia for over 2,000 years. To honor this heritage, Soyombo religious festival has been organized in the last two years. The previous festivals took place in Uvurkhangai and Zavkhan Provinces where many notable lamas attended. This year, the religious festival is planned to take place in Khui Doloon Khudagin in mid-August. Lamas of all 21 provinces of Mongolia, Buryat and Kalmyk will attend the festival. During the Soyombo Festival, Kumiss Festival will be organized, where people can enjoy delicious dairy products. Provinces that are famous for its dairy products will attend the event. The Summer Night Show, which will be organized by the Mongol Naadam Complex, is set to give young people a chance to relax and enjoy summer with dance and modern music by famous DJs. The party will take place at the end of July in Khui Doloon Khudag. The construction work of the Mongol Naadam Complex is expected to be completed around 2020. The complex is expected to become the main venue for national celebrations and festivals in Mongolia. The Mongol Naadam Complex will play a crucial role to the development of sports among children, noted city officials. Its economy and infrastructure is becoming ever more intertwined with Russia's and China's, creating a united economic space. May 8 (Russia Insider) Mongolian President Elbegdorj is on a visit to Moscow for V-Day and is set to meet with Putin to "specify some issues related to economic and infrastructural development". The Asian neighbour is now expecting to sign a strategic partnership with Russia. The two countries have eased visa requirements late last year and are planned to hold joint military exercises in the summer. "We have prepared a document - a medium-term program of the development of strategic partnership. On our part, everything has been approved and now the support of the Russian side is needed. Probably, during the Ufa meeting, we'll sign it." Mongolia is considered to be an emerging market, and Citigroup has identified Mongolia to have one of the most promising growth prospects for 2010–2050. Mongolian troops will take part in the Moscow Victory Parade on Saturday along with those of India, Serbia and six former Soviet republics. May 8 (infomongolia.com) The President of the Russian Federation Vladimir Vladimirovich Putin and President of Mongolia Tsakhia ELBEGDORJ, who is paying a working visit to Moscow, are held a one-to-one meeting in the Kremlin on May 07, 2015. At the beginning of meeting, the head of state V.V.Putin said, "Dear Mr. President! Dear friends! We are very glad to see you here in Moscow and first of all thank you Mr. President for accepting our invitation. This is natural, because Mongolia was the most actively supporting state of the Soviet Union throughout the World War II in the fight against Nazism. Despite of that everyone acknowledges that the relations between our two countries are very friendly and heartfelt with profound and long-standing roots. Of course, we will take advantage of your visit to discuss the entire range of Russian-Mongolian relations. We have a scheduled meeting in the expanded format, where counterparts will be able to cover specific cooperation projects, particular industries and directions. We are very happy to see you. Welcome!" In respond, President Ts.Elbegorj said, "I am very glad that despite your busy schedule, even though we are on the eve of the celebratory events and holiday, you have found time to meet with us and discuss our bilateral cooperation. It gives me great pleasure to wish you a very happy 70th anniversary of the Great Victory on behalf of the Mongolian Government and all the Mongolian people. This Great Victory was our shared victory. Last year, you personally attended the 75th anniversary celebrations of the victory at the Khalkh River. I am delighted that this year, I am attending these celebrations of the 70th anniversary of Victory upon your invitation. We are very pleased that representatives of the Mongolian Armed Forces will participate in the Victory Parade. I am also happy for this opportunity to discuss bilateral cooperation. I would like to congratulate you on your success. We are very happy to see the industrial and economic development of our great neighbor, the Russian Federation, in this difficult time. I am pleased to note that Russia continues to hold a rightfully high position in the international arena. As a neighbor and as a friend, I would like to once again congratulate you on your success". Concluding the meeting Vladimir Putin added, "Thank you. We will also have a trilateral meeting this summer between Mongolia, Russia and China on your initiative. We can take advantage of the events today and tomorrow and discuss the agenda for that trilateral meeting with our Chinese colleagues". On the same day President Ts.Elbegdorj welcomed Minister for Natural Resources and Environment of the Russian Federation, Russian Chairman of the Mongolia-Russia Intergovernmental Commission, Sergey Yefimovich Donskoi and Chairman of the Eurasian Commission Viktor Borisovich Khristenko. May 9 (President.mn) On the sidelines of a Working Visit to the Russian Federation, President of Mongolia Tsakhiagiin Elbegdorj attended a military parade dedicated to the 70th anniversary of Victory in the Great Patriotic War, on Red Square in Moscow. About 30 foreign heads of state and government have taken part in the event. In his opening speech, President of the Russian Federation Vladimir Putin emphasized Mongolia's support for the Soviet Union during the World War II. A group of Mongolian military servicemen took part in the Victory Day Parade and marched across Red Square, for the first time. Following the military parade, President Elbegdorj's working visit to Russia will conclude. May 8 (news.mn) Chairman of the Board of the Eurasian Economic Commission Viktor B. Khristenko has met with President of Mongolia Ts.Elbegdorj, who is paying an official visit to Russia for the 70 year anniversary of World War II. For the past three years, the organization - dedicated to the intensification of trade and economic cooperation between Europe and Asia - was called the Commission on Customs Issues, but starting in January of this year it has been restructured as the Eurasian Economic Commission. President Ts.Elbegdorj noted that the official visit of the Russian minister responsible for integration and the main directions of macroeconomic issues, Tatiyana Dmitrievna Valovaya, to Mongolia was a very productive and directions of future cooperation were determined. Mongolia hopes to define the legal framework for more cooperation and a memorandum of understanding between Mongolia and the Eurasian Economic Commission will be established. The main directions of cooperation will be determined by a joint working group. Representing Mongolia at the meeting were Minister of Foreign Affairs L.Purevsuren, Head of the President's Office P.Tsagaan, Ambassador Extraordinary and Plenipotentiary from Mongolia to Russia Sh.Altangerel. The Russian side was represented by members of the Eurasian Economic Commission, Minister of Trade Slepnev Andrei Aleksandrovich, and other officials. Ulaanbaatar, May 8 (MONTSAME) President of Mongolia Tsakhiagiin Elbegdorj, who is on a working visit to the Russian Federation, received May 7 the Russian Minister of Natural Resources and Environment and a head of the Mongolia-Russia Intergovernmental Commission Mr Sergei Donskoi. The President congratulated on the 70thanniversary of the Victory in the Great Patriotic War and said "The anniversary is being marked solemnly in our country, as well". He noted that many works have been forwarded since the visit of V.V.Putin to Mongolia, including the visa exemption between the people of Russia and Mongolia, which started being implemented last November. "The number of passengers and vehicles crossing the borders has doubled against the period of visa issuance", he said, in that regard, the customs' processes must be accelerated. The sides agreed that the Intergovernmental Commission is the vital mechanism in settling all matters regarding the bilateral cooperation, and that the authorities should focus on intensifying the activities, refine the composition of the Commission and closely assess the implementations of issued decisions by the Commission. As the Commission's activities concern a wide range of issues, the dignitaries exchanged their views on many important matters. Present at the meeting were, the Foreign Minister of Mongolia L.Purevsuren, the Chief of Staff of the President's Office P.Tsagaan, Mongolian Ambassador to Russia Sh.Altangerel, and the head of the Department of Foreign Cooperation at the Russian Ministry of Natural Resources and Environment N.Inamov along with the head of Division for Inter Governmental Cooperation at the Department A.Balakirovna. Ulaanbaatar, May 8 (MONTSAME) The Ambassador Extraordinary and Plenipotentiary of Mongolia to the People's Republic of China (PRC) Mr Ts.Sukhbaatar has participated in a ceremony of laying wreaths to the Monument of Mongolia-Soviet Troops in Zhangbei town, China. Organized by the Embassy of the Russian Federation in the PRC, the ceremony took place on Friday on occasion of the 70th anniversary of the Victory of Great Patriotic War. Apart from the Ambassador of Mongolia, present at the event were the Ambassadors, Minister-Councellors, military attaches and diplomats of Russia, Armenia, Azerbaijan, Belarus, Kazakhstan, Kyrgyzstan, Tajikistan, Turkmenistan and Uzbekistan; authorities of the Secretariat of the Shanghai Cooperation Organization (SCO); and leaders of Zhangjiakou city. Speeches were delivered by the Ambassadors of Mongolia, Russia, Azerbaijan to China; a Deputy Head of the SCO Secretariat; and a Deputy Head of the People's Government of Zhangjiakou city. In his speech, Mr Sukhbaatar emphasized that people of Mongolia, Russia and China have significantly contributed to the Victory of the Great Patriotic War and combating against fascist and militarist forces for setting the peace and justice. He underlined Mongolian people rendered moral and material assistance to the Soviet Union's Red Army in times of the World War II. The Monument was erected in 1957 dedicated to the memory of Mongolia-Soviet troops who fought for liberating China from Japanese invaders. Mr Sukhbaatar expressed thanks to the China's side for caring this Monument all the time, and highlighted the Monument is the symbol of Mongolian, Russian and Chinese peace. He also expressed a satisfaction with widening of the friendly relations and cooperation in all spheres, reaching a strategic partnership level. After the ceremony, the delegates left words on the book of honored guests, and visited a mausoleum museum of the troops. May 8 (infomongolia.com) At the regular plenary session of the State Great Khural (Parliament) held today on May 08, 2015, attending MPs all pinned a symbol of the Great Patriotic War, the Saint George's Ribbon. In his remark, Speaker of Parliament Z.Enkhbold emphasized, "The Mongolia-Russia Parliamentary Group initiated to assimilate with the George's Ribbon commemorating and paying respect to the Victory Day. Mongolia had actively participated in the World War II and at the tomorrow's Moscow Victory Day Parade, the head of state of Mongolia will be participating and the Parliament of Mongolia decided to show its respect on its own way. To briefly note about the WWII and Victory, Mongolia's state leadership, Government authorities, ruling party and Assembly held a Conference on the first day of the war stating its position and issued a Note to support the Soviet Union. Throughout the wartime, Mongolia's 50% of GDP was dedicated to the front. At the end of the War, in fact, Mongolia was involved in the Liberation War in Asia. Therefore, we have the right to wear this ribbon. Happy Victory Day and the 70th Anniversary to Members of Parliament and people of Mongolia to commemorate tomorrow". Ulaanbaatar, May 8 (MONTSAME) During the War of Liberation, thousands of Mongolian soldiers dedicated their lives to fight for the independence and wellbeing of the People's Republic of China, and sanguinary combats took place near the Janchkhuu Davaa (Zhangjiakou). The highest government awards, orders and medals were conferred on soldiers and officers for their feats during the 1945 liberation war. Heroes of the MPR L.Ayush, D.Danzanvaanchig and S.Dampil and others were distinguished among their compatriots. Colonel S.Ganbold concluded that by involving the Mongolian People's Army in this war side by side with the allied powers, not only liberated Inner Mongolia from Japanese occupation, but strengthened the freedom and independence of the country, and demonstrated that Mongolia is a legal nation in international relations. The threat of Mongolian forces seizing parts of Inner Mongolia induced the Republic of China to recognize Outer Mongolia's independence, provided that a referendum was held. The referendum took place on October 20, 1945 with 100 per cent of the electorate voting for independence. The Chinese Kuomintang Government, which had long been considering Mongolia as a part of China, had to recognize the independence of the Mongolian People's Republic and on February 13, 1946, signed the protocol to establish diplomatic relations. In 1949, only three years later, the People's Revolution of China led to establishment of the People's Republic of China. This created favorable external conditions for strengthening independence of the Mongolian People's Republic (MPR). The everlasting significance of the Great Victory over international barbaric forces lies in the fact that it greatly influenced the entire course of world development. It ushered in a new epoch in people's national and social liberation. In this context, lessons of the Second World War are particularly topical and significant. Sofia, May 9 (FOCUS News Agency) Bulgarian President Rosen Plevneliev is expected to pay a visit to Mongolia from May 10 to May 12, the press centre of the President's Office announced. The visit is to be in the context of the 65th anniversary of establishing diplomatic relations between Bulgaria and Mongolia. Emphasis will be laid on the possibilities of strengthening political dialogue, boosting trade and economic cooperation and partnership in fields, such as: mining, pharmaceutics, energy, agriculture and food production, leather industry, high technologies, building modern infrastructure, science, education, and culture. President Rosen Plevneliev will be welcomed at an official ceremony in the capital Ulan Bator on May 11 and will hold talks with Mongolia's political leadership. The Bulgarian Head of State is due to meet with counterpart Tsakhiagiin Elbegdorj, Chairman of Mongolia's State Great Khural (parliament) Zandaakhuu Enkhbold, and Prime Minister Chimediin Saikhanbileg. In the frames of the state visit to Ulan Bator, President Plevneliev is to inaugurate a monument to the Cyrillic alphabet. A joint Mongolian-Bulgarian forum will also be held. Bilateral agreements will be inked, too. Ulan Bator, May 10 (FOCUS News Agency) "We will show that we do not look only to the past but also to the future – we will outline a clear action plan, we will ink bilateral agreements and look for strengthening of the cooperation in the field of agriculture and food production, pharmacy, mining, information and communication technologies, education and cultural exchange, science. We will meet the business of the two countries and we want not only to visit Mongolia but also to stay and realise high-quality products." With these words Bulgarian President Rosen Plevneliev addressed more than 60 Mongolian citizens, who have worked or studied in Bulgaria, at a meeting organised in the frames of his official three-day visit to Mongolia, which started on March 10, the press centre of the President's Office announced. "It is an honour to be on a state visit to friendly Mongolia on the occasion of the 65th anniversary since the establishment of the bilateral diplomatic relations between Bulgaria and Mongolia. It is symbolic enough that my first visit to Mongolia starts with those people, who keep Bulgaria in their hearts, who know and love it. You will help us so as a modern and ambitious Bulgaria to succeed in Mongolia," the Bulgarian Head of State said further. The President considered unique the association of Mongolian citizens, who graduated in Bulgaria and stressed that what had been learned in Bulgaria helped friendly Mongolia in its fast and dynamic development in all fields. "3,500 Mongolian citizens have specialised or graduated their higher education in Bulgaria. There are members of the government, members of the parliament, painters, opera artists, geologists, doctors, agronomists, and others," he commented further. "Yet again Bulgaria has the ambition to be an educational centre in Southeast Europe and we hope that more and more young people will receive their education in our country. The Bulgarian universities are strong, their diplomas are acknowledged in the entire Europe and the world and they are a symbol of high-quality education. You are the symbol of the success of this educational system and we are going to strengthen these ties during my visit," Mr Plevneliev remarked. May 8 (Estonian Public Broadcasting) Estonia has opened its first honorary consulate in Ulaanbaatar, Mongolia. The Estonian honorary consul is Khulan Lkhagvasuren, whose consular territory covers all of Mongolia. According to Foreign Ministry's Undersecretary for European and Transatlantic Relations Mart Laanemäe, Estonian-Mongolian relations are good, yet there is the potential to develop relations in all areas. Laanemäe expressed hope that above all, the opening of the consulate will help strengthen both political and economic ties between Estonia and Mongolia. Estonian Ambassador to Mongolia Toomas Lukk added that Mongolia has expressed interest in Estonia's developments and experience. "Mongolia is particularly interested in our e-government solutions," Lukk specified. Since last year, Estonian citizens can travel to Mongolia visa-free as tourists or for business purposes and stay there without a visa for up to thirty consecutive days. The Mongolian government initially decided to introduce a unilateral visa-free regime until the end of 2015. The Estonian Honorary Consulate is located at Sukhbaatar district in Ulaanbaatar. GAYA, May 9 (Times of India) Prime Minister Narindra Modi would be gifting Buddha tree sapling to China and Mongolia during his ensuing visit to the two countries scheduled this month. The saplings developed in Bodh Gaya under the supervision of the scientists of the Forest Research Institute, Dehradun have been sent to Delhi through a special messenger and a trained gardener from where the sacred sapling will be taken to these countries for presentation during PM Modi's visit. Though South Korea also figures on the PM's three nation itinerary, the sapling is not being taken to that country, as a sapling was already gifted to a South Korea in March 2014. Besides South Korea, Thailand, Nepal, Sri Lankan, Vietnam and Bhutan are the other recipients of the sapling gift. Earlier, during his Nepal visit for the SAARC summit, PM Modi planted a Buddha tree sacred sapling in the neighbouring country. The saplings have been developed by germinating the seeds of the sacred tree, a direct descendant of the original Peepal tree that provided shade to Buddha, then a wandering Prince named Siddhartha from the neighbouring Himalayan Kingdom during the last week of his seven week long final meditation. Siddhartha is believed to have attained enlightenment under the tree about 2500 years back to become Buddha, the enlightened one. Gaya DM Sanjay Agrawal, who heads the Bodh Gaya Temple Management Committee said that the saplings have been sent to Delhi after seeking necessary clearance from the home department of the state government. The sapling will be handed over to the officials of the External Affairs ministry. Special rituals were performed before sending the sapling to Delhi for its onward journey. Asked if the sapling has been developed by cloning the sacred tree, FRI scientist NSK Harsh said that no cloning has been done and the conventional method of first treating the seeds and then germinating the same has been used. Harsh said that their job was simply to provide health care to the sacred tree and the sapling has been developed at the local level. On being questioned as to why the conventional method was adopted whereas the modern cloning techniques were available, Harsh said that cloning meant mass production of saplings that would cause hurt to the sentiments of the Buddha followers who want to preserve the tree's sanctity. Only limited production of sapling on special occasions like gifting it to a foreign head of government was being done. There was no plan to clone the tree, said Harsh. May 9 (Firstpost) Prime Minister Narendra Modi has made a master move in deciding to undertake an official visit to Mongolia next week. Uranium is definitely a big-ticket agenda for Modi's official talks with his Mongolian interlocutors. Mongolia was among the first few countries to sign a uranium deal with India. Though India and Mongolia signed a civilian nuclear deal for uranium supplies way back on 14 September 2009, unfortunately India is still awaiting its first uranium supply from Mongolia. Moreover, Mongolian uranium supply won't materialise during PM Modi's visit to that country. That's because the Mongolian internal processes are still to be completed and uranium supplies are bogged down. PM Modi's Mongolia visit should at best expedite this process but India would still have to wait for its first uranium supply from Mongolia. Why then has the Prime Minister decided to visit Mongolia, a large country with an area of over 1.5 million square kilometers but a population of only three million, roughly a quarter of Delhi's population? Forget uranium folks! India has enough foreign resources now to get this precious metal. The real reason behind PM Modi's Mongolia visit is China. Modi's trip to Mongolia is a win-win situation for the two Asian parliamentary democracies to take their bilateral relationship to the next level for mutual benefit. Mongolia may be a giant sized country but it is dwarfed by two much bigger giants between which it is sandwiched: China and Russia. For this reason, Mongolia wants to put in place its "third neighbor" policy aimed at invigorating ties with India and expanding its foreign policy and business outreach to India and look beyond China and Russia. Strategically and diplomatically speaking, India and Mongolia bring much to the table for each other. Mongolia is the world's second largest land-locked country — after Kazakhstan. It is rich in mineral resources like copper, iron, coal and uranium. So much so that increasing number of Mongolian politicians and political parties are getting visibly affected by Sinophobia. They believe that an unduly high dependence on China for trade and commerce is not good for Mongolia. China has been Mongolia's largest trading partner since 1999 and accounted for over 70 percent of Mongolian exports. Moreover, over 60 percent of Mongolia's foreign investment comes from China alone. Mongolia gained independence from China in 1921 and many in China still refer to Mongolia as 'Outer Mongolia'. Taiwan still officially claims Mongolia as part of its official territory. Against this backdrop, it is understandable that "anti-China-ism" is gaining traction among increasing number of Mongolian politicians and the Mongolian media often runs highly critical news stories about China. Defence and security are increasingly becoming a new focus in India-Mongolia bilateral engagement. This process is going to be intensified with Modi's Mongolia visit. May 8 (Ministry of Foreign Affairs, India) Episode 66: 'India Global' broadcast on AIR FM gold on May 08, 2015 featuring India's relations with Mangolia. May 8 (Eurasia Daily Monitor Volume: 12 Issue: 87, The Jamestown Foundation) Sitting at a strategic crossroads between Europe and East Asia, Mongolia and North Korea are potential economic corridors for the wider Eurasian landmass. However, the realization of such corridors depends in large part on Chinese and Russian policy priorities, since both have long-standing geostrategic interests in the region. If the current trend of regional economic development continues to override the traditional security dilemma of all these neighbors, Mongolia can provide the shortest route for China to Russia, while North Korea could facilitate Russia's outreach to other non-Chinese economies in East Asia. At the same time, Mongolia and North Korea, as the most isolated economies of Northeast Asia, would benefit from Sino-Russian regional development initiatives. Even though Beijing and Moscow have endorsed closer cooperation, they apparently have differing priorities: China advocates the Mongolian economic corridor, whereas Russia prioritizes a corridor through North Korea. The existence of shared, and sometimes competing, Sino-Russian geostrategic interests in Mongolia and North Korea is historically quite clear. When Russia has perceived threat coming through Mongolia in the past, it extended its political and military presence into this landlocked country. Over 20,000 Soviet soldiers lost their lives defending Mongolia from Japanese aggression in 1939, and the Soviet Union maintained over 100,000 military personnel in Mongolia during the period of Sino-Soviet tensions in the 1960s and 1970s. Presently, while not wanting to provoke China, its newly established strategic partner (see EDM, March 10), Russia now has revived its defense ties with Mongolia by organizing bilateral exercises, providing military hardware, and resuming military training assistance (see EDM, March 20, 2013; October 9, 2013). Similarly, over 150,000 Chinese soldiers and volunteers lost their lives in defense of North Korea in 1953, and China is still committed to the mutual defense aid and cooperation treaty, which was renewed in 2001. Moscow and Beijing continue to emphasize these bonds by attending, at the highest level possible, events commemorating such past joint military endeavors. This clearly indicates that Mongolia and North Korea remain geostrategically significant for Moscow and Beijing. But, economically, China and Russia have differing priorities. China appears quite supportive of Mongolia's initiative to become a Eurasian economic corridor, and it quickly included Mongolia in the Silk Road Economic Belt initiative as well as the Asian Infrastructure Development Bank. At a summit in Dushanbe, Chinese President Xi Jinping proposed a Mongolian economic corridor that would increase transit infrastructure and Mongolia's power grid network (Xinhua News, December 4, 2014). Earlier this year, Chinese Foreign Minister Wang Yi repeated Beijing's interest in building an economic corridor through Mongolia. He articulated that this corridor would be an organic combination of China's Belt and Road initiative, Mongolia's Prairie Road and Russia's Eurasian Railway initiatives (Chinese Foreign Ministry press release, April 2). In contrast, China has, to date, excluded the Democratic People's Republic of Korea (DPRK—North Korea) from both economic belt and infrastructure bank initiatives, even though there were previously such discussions with North Korean officials. This may indicate Beijing's priorities of bringing Mongolia, Central Asian states, and South Korea closer under the China-centric regional economic order at this time of strategic convenience. Whereas, regarding Pyongyang, Beijing seems to have decided that it would prefer to restrict Chinese-DPRK economic relations to their present level. North Korea currently has quite limited options and must rely on Chinese capital, technology and markets. Russia, on the other hand, appears to have prioritized the North Korean economic link rather than Mongolia's economic corridor for several reasons. First, Russia's engagement with North Korea would provide more opportunities to project Moscow's image of a "Great Power" in the Asia-Pacific—particularly since Pyongyang considers Moscow a reliable partner in balancing against Beijing as well as other members of the Six Party Talks on North Korea's denuclearization. In late September 2014, Pyongyang dispatched its foreign minister to Russia to build up a united political front as both countries have come under sanctions from the West (Mid.ru, September 29, 2014; The Guardian, September 30, 2014). Second, Russia's investment into North Korea promises a quicker and greater return than its investment into Mongolia, which would provide only an additional route for Russian exports to China. In the case of North Korea, Russia is more interested in gaining access to ice-free ports on the Pacific coast and investing into transit routes for its mineral exports to the wider East Asian region. This would provide access to some of East Asia's largest resource importers, including South Korea, Japan and Taiwan. 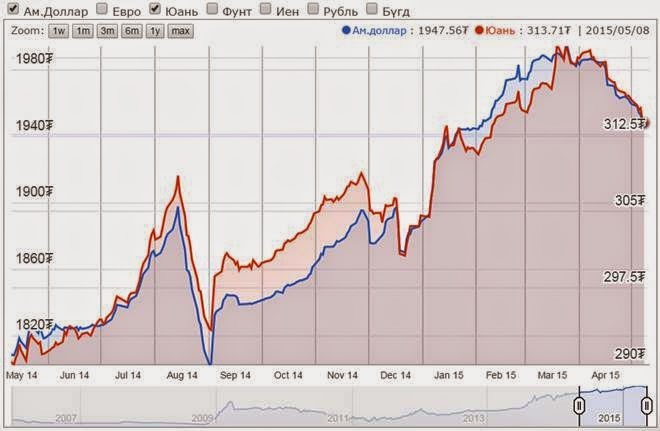 Third, Russia sees more investment opportunities overall in North Korea than Mongolia. This may be especially true considering the strong South Korean interest in linking the trans-Siberian railway with the trans-Korean railways. Indeed, Russia has already expanded its business presence in Pyongyang and started playing a key role in implementing such trilateral projects (see EDM, May 7, 2014). In contrast, Moscow's policy toward Mongolia has been largely for Russia to regain its former "privileged status" in areas of major Mongolian mining projects, infrastructure development and energy sectors. But this contradicts shifting political and economic realities in Mongolia, which has been seeking to diversify its global economic and investment partnerships (see EDM, February 20, March 2, April 6). Therefore, most emerging projects like new railroads, uranium mining and energy, where Russia and its state-affiliated business entrepreneurs expressed an interest, have become victims of local politics. While concerned with their traditional geostrategic interests, China and Russia are pursuing different policy priorities for establishment economic corridors in peripheral states. China is more interested in funding infrastructure development projects in Mongolia, whereas Russia prioritizes North Korean economic links and economic opportunities. Despite the entirely different political systems in Ulaanbaatar and Pyongyang, both present risk and uncertainty for long-term investment projects—even when amicable Sino-Russian interactions create a favorable momentum for closer economic cooperation. May 8 (RT.com) Russia and China have signed a number of energy, trade and finance deals on Friday aimed at strengthening economic ties. The two countries have multiple mutual projects which "achieved a unity of views on a wide range of issues." Russian President Vladimir Putin and Chinese leader Xi Jinping have signed a decree on cooperation in tying the development of the Eurasian Economic Union with the "Silk Road" economic project. "The integration of the Eurasian Economic Union and Silk Road projects means reaching a new level of partnership and actually implies a common economic space on the continent," Putin said after the meeting with his Chinese counterpart. President Xi Jinping arrived in Moscow on Friday for the 70th anniversary celebration of the defeat of Nazi Germany in World War II. Russia's largest gas producer Gazprom and China's National Petroleum Corporation (CNPC) signed an agreement on the basic conditions of gas supplies from Russia to China through the Western route. The two companies decided to extend a strategic partnership agreement for five years, according to Gazprom's CEO Aleksey Miller. The agreement provides for the construction of the first, second and third Altai pipelines. Sberbank – Russia's biggest lender - has signed a facility agreement with China's Development Bank in the amount of $966 million. They also agreed on financing an industrial project by Sberbank to the tune of $256.4 million. The goal of the agreement is to develop the "long-term cooperation between Sberbank and China Development Bank in the area of financing foreign trade operations between Russia and China," Sberbank said. President Putin also said that Moscow welcomes Chinese companies' participation in resource extraction in the Arctic and Sakhalin shelf. Earlier on Friday, Russian Direct Investment Fund (RDIF), the Russia-China Investment Fund (RCIF) and the People's Government of Heilongjiang Province agreed to launch a $2 billion fund targeting investment in agricultural projects in both countries. The share of Chinese investment in Russia may soon reach 20 percent and amount to 40 percent in the medium to long-term, according to the CEO of RDIF Kirill Dmitriev. Ulaanbaatar, May 8 (MONTSAME) The government of Mongolia Thursday made a decision to render humanitarian aid to people of Nepal that was badly affected by a fatal earthquake occurred on April 25, 2015. Due to the natural disaster, over 7,000 people have died, and over 17 thousand people got injured. By the decision, Mongolia will give to Nepal medicine and treatment materials. The money for the humanitarian aid has been allotted from the governmental reserve fund. May 8 (infomongolia.com) On May 06, 2015, Minister for Defense of Mongolia, Tserendash TSOLMON held a bilateral talk in Istanbul with his counterpart of Turkey, the Minister of National Defense, Ismet Yılmaz. During the meeting, the sides inked an intergovernmental agreement of cooperation in industrial sector, where representing Mongolia, Ambassador Extraordinary and Plenipotentiary of Mongolia to the Republic of Turkey B.Batkhishig, Consul General of Mongolia in Istanbul E.Munkh-Orgil and other officials from Defense Ministry were present. In his remark, Defense Minister Ts.Tsolmon underlined that collaboration between the defense sectors have been successfully developing and expressed his interest to increase the number of Mongolian officers to study in Turkey as well as to increase the volume of Turkish grant aid and requested to assist in construction of renewing the Kharkhorin Airport and to support on developing the tourism sector. In turn, Defense Minister I.Yilmaz affirmed that the number of Mongolian militants to study in Turkey is capable to increase and said to consider on grant aid. Also, advised to prepare and send to Turkish side the studies and calculation on project regarding the construction of Kharkhorin Airport. Following the meeting, Minister Ts.Tsolmon got acquainted with the International Defense Industry Fair opened recently and met with authorities of some companies supplying defense products to Mongolia. In conjunction, the Ambassador Extraordinary and Plenipotentiary of the Republic of Turkey to Mongolia, Murat Karagoz received in his office some academicians and scholars conducting research works relevant to Mongolia-Turkey history, culture and archaeological studies. During the meeting held on May 06, 2015, visitors were represented by Institute of Archaeology at Mongolian Academy of Sciences, Institute of Literature, Department of Turkic at Mongolian State University's School of Asian Studies and Department of History and Culture at University of Science and Technology to discuss current situation on Mongolian-Turkish joint archaeological study, challenges facing and exchanged views on further measures to be taken. Mongolian delegates underlined that the latter joint science conference was organized in Mongolia in 2010 and in order to work more effectively they noted to prepare Mongolian and Turkish young staff from now, because the archaeological studies take long term and in the meantime a group working on one studies are changed frequently that negatively impacts. Therefore, they requested to organize a frequent online meeting with its Turkish counterparts. Turkish Ambassador M.Karagoz emphasized that Mongolia contains many of Turkish historical and cultural remains and thus to back the initiation developing bilateral archaeological studies and pledged to partner on this issue. May 8 (gogo.mn) "Khusugtun" Mongolian ethnic group was selected as finalist at "Asia's Got Talent" show. They had passed the semi final round which was held on May 07. Voting has started on May 07 and will finish on May 11. There are three easy ways to vote including Sms Voting, Facebook Voting and App Voting. Total of nine finalists emerging from the three semifinal rounds. The finals, like the semifinals, will be held at the Marina Bay Sands over a span of two episodes, a performance night and a results night. It is presumed that the final two public vote finalists from the third semifinal round would be present together the finalists who already advanced. Click here to vote for Khusugtun via facebook. Below is the interview of "Khusugtun" Mongolian ethnic group. Q :Which city do you come together to practice in? Q :How did your group first get together and how are you staying together? We all studied in same college. Then we worked together in the dance and music ensemble. Q :Which other competitions have you entered before Asia's Got Talent? We did many competitions like 'Sibirian Peace' in Russia, 'Wind Songs' in Mongolia and 'Delphic-3' in Korea. Q :Why did you enter Asia's Got Talent? To promote Mongolian music around the world. Q :Describe your act's experience in Asia's Got Talent so far? Great experience. We are very happy to represent Mongolian music, culture and history through this amazing world class show! Q :Who is your favourite judge and why? David and Anggun because we met Anggun at the "Pantene" event and she was extremely nice to us. David is a very fair judge even though he looks tough. Also, he thanked us personally for introducing our music to him. Q :How many hours per day and per week do you practice? 8 hours a day when we are working. Sometimes 7 days a week if there is work at the ensemble. But our band usually practice 2 hours a day and 3-4 days a week. Q :Please share with us how a typical day is like for your act? Work, work and work. And performances on our own at the different events. Off days are for the families. Q :What do you think are your chances to win Asia's Got Talent and why? We think our chances are very high, because we found out that there are many foreigners that like our music and have voted for us, besides our Mongolian fans. Q :What will you do with the prize money if you win Asia's Got Talent? Most of us have loans so we will pay some of our loans. We will share it with our families and friends and some of it we will give to charity, to homeless kids and orphan kids. · Mongolia's rural communities depend their livelihoods on a fragile eco-system which is subject to degradation of pastures, and highly vulnerable to severe climate. · "Sustainable Livelihoods Program" (SLP) was launched to address these challenges and to increase the flow of public and private investment to herders' communities. · As the program entered the 3rd phase, herders look forward to more improvements in their lives. Ulaan Uul, Mongolia, May 7 (World Bank) – While Mongolia has experienced drastic changes, driven by the fast economic growth and the mining boom, one third of its people remain on the steppe, continuing their lifestyle as nomadic herders. They often live far from settlements, making it challenging and costly to provide basic services, infrastructure and communications systems to them. Their livelihoods are dependent on access to a fragile eco-system which is subject to degradation of over-grazed or mismanaged pastures, and highly vulnerable to severe climate like the harsh, cold winters known as dzud in Mongolian. In 2001, following two years of particularly harsh dzud which killed almost one third of the country's livestock, the Government of Mongolia and the World Bank began to work together to address these challenges and to increase the flow of public and private investment to herders' communities in rural areas. The three-phase "Sustainable Livelihoods Program" (SLP) was launched in 2002. The first phase, from 2002-2007, demonstrated new approaches to rural service delivery and community participation in decision making by establishing community development funds that helped communities to identify investments to address pastoral risk and improve their livelihoods. In the second phase, from 2007-2013, an expanded program led to community development fund financing for more than 6,000 sub-projects, mostly for investments in education, health, pasture management and micro-finance to support emergence of local entrepreneurs. Most importantly, SLP2 led to the institutionalization of the decentralization process through the enactment of the Integrated Budget Law, paving the way for financial resources flow to local government. SLP3 is designed to support continued implementation of the Integrated Budget Law, government decentralization policy, and other reforms. It will build capacity for the local governments to manage Local Development Funds, which will finance investments in rural infrastructure and services at the local level. T. Morongha, a teacher at Ulaan Uul Elementary School, is reaping the benefits brought by the program. "It was freezing cold in the winter. Students and teachers had to wear thick coats even indoors," she said. "The program allowed us to put a stove in each classroom. Students can now remove their coats in class. Teaching and learning became an enjoyable experience." B. Oronhishig, sports coach of Ulaan Uul High School, echoes her. "Before, cold wind would blow in from the windows. The floors were freezing cold, making it difficult to teach," he said. In 2012, when the teachers got together and discussed on how to use the community development funds under SLP, he proposed to renovate the school gym. "We insulated the walls and the floors of the gymnasium. Now, it is quite warm and cozy in there when we train," he said. "We spent $2,500 from the funds on the school gym renovation. With the rest of the funds, we were able to light the streets in town, build a medicine bath to disinfect the livestock and also build two fenced enclosures to treat sick animals in each of the five herding divisions of the county," said M. Enkhtuur, SLP Project Coordinator, Ulaan Uul County. There was something even more fundamental than these infrastructure improvements. "To allocate funds for these developments, all the herding divisions in the county got together. People's needs and priorities were expressed out loud and clear," he said. "Now our local government listens before spending the money. They advise us on business loans, contract us for services and labor. I feel our voices are being heard," said Purevjav, a 70-year-old herder. "We provide loans to help rural residents start small businesses. Some people have started small vegetable farms, for example. We buy their produce to supply local demand in town," said N. Batbayar, Governor, Ulaan Uul County. Before, projects were administered top-down – central or provincial authorities dictated local development, with little or no say from the local communities, says Kh. Gantsogt, State Secretary of Mongolia's Ministry of Finance. "Thanks to the Sustainable Livelihoods Program, we are looking at development from a new angle. Projects implemented with the direct consent of the local people tend to be more sustainable in the long run," he says. As the program entered the 3rd phase, herders already expressed their wishes which they hope could be realized in the new phase. Tsorj the 'Giant', a herder in the Ulaan Uul County, said he was happy that the old well on his spring pastures was repaired. "But water is also becoming scarce on our winter pastures," he said. "I would suggest digging another well there next year. The next big concern in our lives is water!" Ulaanbaatar, May 8 (MONTSAME) "National Public Tree-Planting Day" is going to be celebrated on May 9, in accordance with the Presidential decree issued in 2010 directing to mark the Day on Saturday of second week of every May and October. The Ministry of Environment, Green Development and Tourism has set a goal to plant one million trees in 2015. This year's tree-planting day coincides with the 70th anniversary of the Victory in the Great Patriotic War. In order to responsibly take care of the trees, the Ministry resolved launching a work to issue code for every tree that had been planted and submit them to an online registration system. The system will keep record of investors of the tree-planting, planters, caretakers, and utilized gardening materials. The first codes will be given to 70 black alder trees to be planted Saturday by the staff of the President's Office. May 8 (gogo.mn) Last weekend, our traveling group steered its wheel to Selenge aimag which is famous for its Saihanii Hutul, Tujiin Nars (The Pine Forest) and Eej mod (The Mother Tree) with its spectacular mountains, trees and the Orkhon and Selenge river valley. Darkhan-Uul aimag is located in the middle of the aimag. Our journey started at 8PM on Friday and it took us over five hours to reach to our destination located about 360 km away from Ulaanbaatar city. We spent the night at one of our traveler's house and we started our second day journey at 11AM from Sukhbaatar soum of Selenge aimag. Infrastructure: railroad and paved roads are fully developed; the heat and electricity supply are guaranteed. Mining and agriculture are the most developed business areas. The number of companies is now 2106. Spirt Bal Buram PLC, Khutol Tsement Shokhoi PLC, Bold Tumor Yeruu Gol Co.Ltd, a branch of Altan Taria PLC are companies which are active nationwide. We visited at monument located on a hill, west of the soum where you can visit Queen Khulan monument who was an empress of Chinggis Khan and other fascinating views. After driving to the uppermost parking lot on the hill, visitors must make a climb before reaching the monument. Those who make the climb are rewarded with a panoramic view of the entire soum of Sukhbaatar in the valley below, as well as the Orkhon river flowing past the soum. Next, we headed to Saihanii Hutul which is the most attractive destination of not only Selenge aimag, but also Mongolia, where you can observe Orkhon and Selenge river basins from the top of the mountains. Orkhon and Selenge rivers flow into Lake Baikal and considered as the biggest rivers of Mongolia. View into Saihanii Hutul might be brighter in the summer. However, one who visits there could not forget that spectacular view for a lifetime whether it is summer or spring. Border guards furnished Saihanii Hutul with stairs, tables and chairs to rest, little bridges as well as stone monuments. Then, we headed to the ger camp for rest. There are many lodging and ger camps in many locations nearby Sukhbaatar soum, which offer all the comforts for the visitors and tourists for the maximum relaxation and adventure on the road at the luxury of the forest. The nearest camp is located 10 km away from the Sukhbaatar soum. The cost for one night at ger was around MNT 50.000 with five beds. There we watched beautiful purple ledum (daurian rhododendron). Next morning (Sunday), we left the camp at 12PM to go back to Ulaanbaatar city. Three kilometres away from the Sukhbaatar soum, we visited Eej Mod (The Mother Tree) which is worshiped by Mongolians as wish granter. People respect and pray for Eej Mod and whisper their whishes and dreams. Make sure you bring rice, milk, matches, incense, and candy/cookies as offerings. The original Eej Mod has been cut down due to catch on fire, but you can still wish and give tribute to its stump. Our final stop was Tujiin Nars (Pine Forest) in Selenge aimag which spreads over hundreds of kilometers. The evergreen Pine Forest grown at the both sides of the road leading your way through the breathtaking alley of trees. Earlier, Tujiin Nars trees were densely grown and covered more areas compared with the situation today. However, due to forest fire and other external impacts caused Tujiin Nars to decrease. The Government of Mongolia assigned to reforest the Tujiin Nars. In result, the evergreen Pine Forest has been successfully growing and expanding year by year. Our traveling group consisted of 10 person and budget for per person was MNT 70.000. We went to Selenge aimag with two cars and the oil for cars costed around MNT 220.000. For food, we carried portable gas hotplate and purchased main food items from Sukhbaatar soum and cooked by ourselves. As I mentioned before, Darkhan-Uul aimag is located in the middle of the Selenge aimag. Therefore, you will pass through the third biggest city of Mongolia, Darkhan city and you will have opportunity to visit there. Stay tuned with us for more travel destinations in Mongolia. Click here to read our previous travel destination. May 8 (gogo.mn) Two years ago, we headed to Tsagaan lake in Bulgan aimag to observe birds. As the dawn breaks, we sat in little boat and waited for birds. Suddenly, a little bird with bright pink beak and yellow eyes appeared in rush. It was the young male bearded reedling (Panurus biarmicus). He sat on the edge of the rush and watched us for a few seconds and he left us to catch his prey. I read from book that bearded reedling is not afraid of human, but it was not true. After an hour, two male birds sat on the rush and cleaned their plumage. They might have had their breakfast already. They seemed very friendly by helping each other on cleaning their plumage. Soon, they took a nap. During the harsh winter night, they sit huddled together in the cold to warm each other. Another bearded reedling arrived and carefully watched us. This one has black beak and no beard thus she might be female. Bearded reedlings like to clean their plumage often. We waited for another species of birds to come. Suddenly, an adult male bird came from the water. He seemed bit tired. He was busy with finding prey for his hatching. Even though he looks angry and he has beard, he might be a good father. The bearded reedling live in a lake filled with rush during all seasons and construct their nest in middle of the rush. During the summer time, they feed with water shellfish and feed with rush seed in winter time. I first saw the bearded reedling in 2013 and since then, I have always been looking for them. Because they have unique appearance and photographers like to take photos of them. Photography of those birds mostly ranks top at international competitions. This is a small orange-brown bird with a long tail and an undulating flight. The male has a grey head and black moustache. Females are calm and they often clean themselves. It i s hard to see when the pair goes under a bush. When they fly, they seem like little white ball going up and down and one can immediately lose the sight of them. The bearded reedling choose their pair at their young age like humans and live together for their remaining lifetime. They have up to one breeding in a year. It is resident, and most birds do not migrate other than eruptive or cold weather movements. It is vulnerable to harsh winters, which may kill many birds. It is interesting to observe this beautiful bird. If you want to visit L.Jargalsaikhan's Flickr profile, click here please. May 8 (gogo.mn) We are introducing one interesting man with quite an interesting view on life. He snaps photos with his smartphone, yet the results are stunning. Although he works as a marketing manager, every free time he has he dedicates to taking photos with his phone and delivers the good vibes to others. His name is B.Munkhtulga. He posts his photos and videos to his Instagram account known as Tulguush. -Since when you started taking photos with your phone with the purpose of delivering them to public? -In summer during my vacation in Sukhbaatar aimag I took photo of a ger in a steppe, which gathered a lot of positive comments. Since that photo I stared to try to snap good shots with my smartphone. -In a description of you Instagram account you put iPhone only. -This is not to draw a line on which is good or bad. I have been taking photos with Samsung smartphones as well. But personally I prefer iPhone. There are many good phones, but still iPhone is my preference. -Photographers carry their cameras everywhere they go. For you it is much convenient. -For me I use smartphone for the purposes of taking photos. Recently I have broken my phone it was so inconvenient, because I could not take photos rather than use it for the communication. I also like to walk. I tend to think how I can capture this particular thing and scene. The difference of taking photos with a phone is that one starts to see the things in borders. Moreover, one tends to become more observant. If you capture a part of street or a building that one might have passed hundred times before, they start to ask where this particular thing is located. I think that it is important to love what you do. I get a good feeling from taking photos. -In order to be doing one thing as a hobby and be led by it one has to have noticed the changes and the results from the particular activity. How does photography changed you? -I love travelling, but I did not have the time to spare. But after I started taking photos I started travelling. Also I started visiting exhibitions, started joining hiking clubs. I go hiking every week. More to health benefits I like to take hike because I can take photos. It is tiring to sit five days a week for 8 hours behind the computer physically and emotionally. We become prone to stress. Hiking and taking photos during the weekend helps to get away from the daily stress. I have come to realize that one starts to do more things. -I heard that Instagram community does meetings. More on that? -There are many instagrammers in Mongolia. There are many of those who upload nice pictures of locations. Some of those guys meet and we do the photoshoots together. In March I joined the meeting. There were over 40 of us who have never met before. It was a good experience for all of us. We upload our photos with a hashtag #instameetmongolia. It is an interesting experience. We meet on a bi-weekly basis and altogether go to take photos. Our communitiy involves highschoolers, students and those who work. The main benefit of our meetings is that the youth is spending their free time appropriately. Some of our members a good photographers so it is a good chance to learn the new techniques. Joining those meetings helps a lot to improve my skills. Some of us help each other by modelling for each other. It is open to everyone who uses Instagram. We usually announce the dates of our meetings. After joining Instameetmongolia I started calling my friends in to model for me. Last weekend we travelled to Selenge aimag and did some photoshoots. -I guess having your friends to model makes it easier for you? -Indeed. Also it is easier for them to model. Previously I never uploaded my photos to my Facebook account. Lately after uploading some of my photos I got encouraged by my friends a lot. I started to invite them to join me on my trips. -In order to take good photos the sense of a photographer is important. It is important that photo has the feel to it and a composition. Have you been arts classes before? -I used to paint in secondary school. With some of my classmates we have put on an exhibition of our works and been awarded with medal. May be I have traces of that. But I don't link it to the artistic skills. It is more of a feel and sense and desire. When I receive good feedback on my photos I am more encouraged to take good photos. I like to deliver the good vibe I felt through my photos. I like the feeling of how others are delighed with my photos. It is good that I can give a good vibe. The Onon Balj National Park administration in partnership with WWF Mongolia is pleased to announce the appointment of recent UMSL graduate Matthew Fox as lead biologist at Onon Balj National Park, Dadal soum, Mongolia. Matthew will graduate in May with a BIS degree in Wildlife Conservation, and will begin his position at Onon Balj on the first of July. His duties will include the training of local students and Onon Balj rangers in the use of radio telemetry equipment, mist nets, Sherman traps and bal-chatri traps. He will assist in the development of a master plan for the park, help translate documents from Mongolian to English and begin a series of studies of his own design on the small mammals of the Dadal soum region. Matthew has been a field biologist since 2006, and has worked at study sites throughout Asia, Africa, South America and Central America. In previous positions he has tracked the Andean spectacled bear (Tremarctos ornatus) in the cloud forests of Ecuador, anesthetized and studied wild argali sheep (Ovis ammon) in the Gobi desert and has served as a safari guide in the Kruger National Park of South Africa. The small mammals of Onon Balj National Park have never been surveyed before, but it is expected that Matthew's studies will reveal new populations of Mongolian hamster (Allocricetulus curtatus), Djungarian hamster (Phodopus sungorus), Mongolian gerbil (Meriones unguiculatus) and the illusive four-toed jerboa (Allactaga tetradactyla). To perform his study, Matthew will requires 50x Sherman traps, 200x 3/32" I.D tags, at least two additional GPS devices, various tools including multiple sets of forceps and pliers, bite resistant gloves for the students and bait for all 50 traps over the course of the study. The Onon Balj National Park is a critical habitat site for wolverine, red deer, demoiselle crane and taimen. With the conclusion of Matthew's study, Matthew and the Onon Balj National Park administration can begin augmenting the park's master plan to include conservation strategies for Onon Balj's smallest residents. May 7 (UB Post) A joint exhibition by the graduate students of the School of Fine Arts (SFA) is being presented at the Union of Mongolian Artists through May, 9. Paintings, textiles and other work by 97 students are on display in the gallery. This is an exciting time for the SFA at the Mongolian State University of Arts and Culture, with its 70th anniversary taking place this year. The joint exhibition of SFA graduate students is also going to be presented in Hohhot, China, in June, by the invitation of the arts program at Inner Mongolia University. Of all the creations presented in the exhibition, the fashion collection called "Tsam of Futurism" designed by M.Nyamsuren, was my favorite. I loved its detail, use of shape, style, and the overall meaning of the collection. I wanted to know more about it. The following is a brief interview with the talented graduate student and designer of the "Tsam of Futurism" collection, M.Nyamsuren. My name is Nyamsuren, people know me as Niima. I am a graduate student at the School of Fine Arts, majoring in costume design. Please tell us about the "Tsam of Futurism" collection? The art, culture, and the heritage of the Mongolian dance called Tsam is very rich to study. The costume of the Tsam dance has its own style, expression and meaning. I used the silhouette of the Tsam dance costume and connected it to the futurist style of postmodernism. What does the name of the collection mean? I studied the ancient tradition, connected it to modern times, and named my collection "Tsam of Futurism." Why did you use only white? Since the Tsam dance is a religious sacrament, the costume kept up tradition and the sense of the beauty of that time. The costume of the Tsam dance includes the harmony of many colors. Since I connected the costume to futurism, I had to hesitate in using some of its traditional elements. White expresses the mix of Tsam and futurism. How did you find this style? In my mind, any artist is never full. We always search for brand new ideas, designs, and get inspiration from them. That's how artists create their pieces. I found the "Tsam of Futurism" collection by conducting research and coming up with my own concepts. The arts play a crucial role in society to enlighten people. That's why any facet of the arts must be encouraged by the state. The youth occupy the majority of society in Mongolia, which is our advantage. There are lots of youth who are extremely talented, hardworking, and skilled. One of our missions is to introduce modern art to people. I think my collection, "Tsam of Futursim", showed its meaning rather than talking about or explaining it. I think it is right for an artist to make the responsibility of their art as his or her own goals. May 7 (UB Post) "The Epic of the Great Queens of Mongolia" will be performed again on May 12, at the request of audiences. More than 6,000 people have watched "The Epic of the Great Queens of Mongolia" dance play. The Mongolian National Song And Dance Academic Ensemble of Mongolia first performed the play, which tells the saga of the nine queens of Mongol Empire, on December 2013. The play was also performed on February 2014. The ensemble performed the play for the third time on January 29 and 30, 2015. "The Epic of Great Queens on Mongolia" dance play is about nine great queens of Mongolia; Gua Maral, Mother Alungoo, Mother Oulen, Queens Burte, Durgunu, Sorghaghtani, Chimbai, Samar, and Mandukhai the wise, whom all immortalized the great history of Mongolia through their courageous acts and feats. "'The Epic of the Great Queens of Mongolia' was greatly applauded by audiences in its first, second and third staging. The Mongolian National Song And Dance Academic Ensemble has decided to stage the dance play again," said a spokesperson of the ensemble. The dance play is unique in expressing the history of the legendary queens of the Mongol Empire, who are remembered in history for their great merits in the fight for independence, through the language of dance. The play is considered to be a national masterpiece by critics and enthusiasts. The libretto of the play was written by vice president of the Mongolian National Song and Dance Academic Ensemble N.Bold and is directed by D.Bayarbaatar. The musical composition was written by M.Birvaa and composed by State Honored Composer B.Munkhbold. PHILADELPHIA, May 9 (CBS) — A new exhibit at The Franklin Institute uncovers the amazing story of one of the world's greatest leaders and most misunderstood conquerors. Genghis Khan: Bring the Legend to Life takes visitors on an unforgettable journey into the legendary Mongol Empire and its founder. "This exhibit really attempts to explain Genghis Khan," says Troy Collins, Senior Vice President of Earned Revenue, Marketing and Operations at The Franklin Institute, "not only as a great military leader, but as an inventor of tools, policies, practices, religious freedom and really the impact of his conquests and what they had on the world and the descendents of both Genghis Khan and the people that he ruled over." Collins says Genghis Khan as a military leader is intriguing to many people and how he was able to achieve his victories is interesting to folks, but the goal of the exhibit is much deeper. "We want them to walk away with a more comprehensive picture both on his impact of that region, on society and even the modern world today," he says. "The Franklin Institute tells stories in a theatrical manner using authentic objects. If people have been to exhibits such as Pompeii, Cleopatra or King Tut, they're going to see a similar style here, and they're going to walk away with a very good picture of Genghis Khan and his impact." The idea came from Philadelphia-area dinosaur guru Don Lessem, who discovered the genius of Khan while exploring Mongolia and set out to share the story of the real Genghis. Collins says years later, The Franklin Institute is the exhibit's first northeast stop on an international tour. "For the past five years it's been seen by over one-million people already in three countries and ten venues," he says, "so it is not a perfectly brand new exhibit, but it has certainly been customized for The Franklin Institute." The exhibition features more than two-hundred stunning artifacts; most never-before-seen and recently gathered from private collectors in Mongolia, Azerbaijan, and the United States. "Some of the objects that the public will be able to see not only include some of the weaponry that was used by Genghis' armed forces, but also household items, clothing, textiles, pieces of art, household tools and the like," Collins says. "Many pieces of clothing, including robes, monuments and other documents that were used during that time." Visitors will get a close up look at one of the world's earliest guns, a sword carried by one of Marco Polo's guards, along with a 12-foot crossbow and flaming arrows used by the Mongolians. Collins says the exhibit will allow to people to discover Genghis Khan's legacy as both a ruthless warrior and a revered statesman. "He's an important historical figure," Collins says. "And not only will the exhibit focus on some of the bad that he did, it will focus on some of the good. But the most important is that people come in with an open mind and they get to learn, and by the time they leave, they will have a much better picture of his impact, as well as hopefully some more questions that they want to research themselves about a very pertinent leader." Murals and video projections allow visitors to experience the sight and sound of warriors on galloping horses in battlefields. There are also several interactive elements, including firing catapults and computerized role-playing. All of this letting visitors explore life in 13th century Central Asia. "The goal of this exhibit, like most of our other exhibits is to inspire a passion for learning about science, technology, history, anthropology, archeology," Collins says. "The Franklin Institute is a place of learning, and we hope that people come, they enjoy the exhibit, they're entertained by it, but that they also walk away with a feeling of passion, a feeling of wanting to learn more." Genghis Khan: Bring the Legend to Life runs from May 9 through January 3. For more information visit The Franklin Institute's website. May 7 (New York Tiimes) A feisty, passionate performance by the Irish actress Deirdre O'Kane gives the inspirational biopic "Noble" a serrated edge of defiance and gumption. Its subject, Christina Noble, is an Irish children's rights activist and writer, who traveled to Ho Chi Minh City in 1989 and established a foundation that has set up more than 100 projects in Vietnam and Mongolia that provide protection, education and health care for more than 700,000 children and their families. As the movie tells it, television coverage of the Vietnam War inspired visionary nightmares that led Christina to Ho Chi Minh City, formerly Saigon, where the plight of orphaned, homeless children squatting in abandoned buildings drove her to take action. Her efforts to help them were repeatedly thwarted by indifferent officials. Threatened with deportation, she was given three months to secure sponsorship for a program to help the children. In many ways, "Noble" is a standard tale of one tenacious individual's determination to make a difference. And in bluntly connecting Christina's campaign with her own nightmarish childhood in late-1940s and '50s Dublin, the movie partly avoids the sticky sentimentality of the typical do-gooder film portrait. High-spirited and rebellious from a young age, she dreamed of a singing career like her idol Doris Day. She also had conversations with God. When her alcoholic father couldn't keep the family together, the children were distributed to various institutions. Christina landed in a school run by nuns where she was treated harshly. Even after she was viciously raped and the son she bore sent away, her spirit was not broken. Christina overcomes misfortune by fighting back. When she marries, you imagine she has found deliverance. But no; her husband is violently abusive. As the movie tells it, everything she achieves is accomplished almost single-handedly. She had to browbeat most of her allies, including one played by Brendan Coyle of "Downton Abbey" fame, into embracing her cause. The movie rather confusedly jumps around in time with flashbacks to this or that turning point. The seemingly random time-scrambling at least lends Christina's story some consistency by reminding you of the hardships she overcame. Ms. O'Kane's brusque performance portrays Christina as a woman who acts on her principles and has little time for making nice. She is a compelling embodiment of the adage "What doesn't kill you makes you stronger." "Noble" is rated PG-13 (Parents strongly cautioned) for violence and sexual situations. May 10 (The Daily Meal) Mongolian cuisine is not vast, but its staple dishes are a delicious combination of Russian and Chinese flavors. It is very heavy in animal meat and animal fat, as their heartiness helps the people of Mongolia survive extremely harsh weather. While meat is a huge component of the Mongolian diet, you will rarely see chicken or pork in this fare — and especially not fish, as the country is landlocked. You will, however, find mutton, beef, lamb, horse, camel, yak, and marmot meat on the menu. Let's just say that adventurous eaters are more likely to enjoy this cuisine, which is made to suit a nomadic lifestyle. A popular style of cooking involves hot stones, and some Mongolian people even stuff animal carcasses with hot stones in order to cook the meat from the inside, which keeps it from getting too dry or tough. Non-adventurous eaters still have a few things to enjoy, like meaty dumplings and compact doughnuts. Sorry to disappoint, but "Mongolian Barbeque" is not Mongolian; it is Taiwanese. Nevertheless, here are a few other things to be enjoyed in the Central Asian country's cuisine. Note: the most popular side dish in Mongolia is vodka. A deep-fried dumpling, similar to an empanada, consisting of ground mutton (or beef) mixed with onion, garlic, salt, and other spices, all deep-fried in mutton fat. Some people put the hot dumplings on their foreheads or the soles of their feet in order to treat neurosis or other health issues. We would probably be too busy eating them to test that out. The unfried version is called buuz. Suutei tsai is like a regular milk tea, consisting of water, milk, and evaporated tea leaves, except it also includes salt. It's not for everybody, but the strong taste of salt contrasts the sweetness in a surprisingly pleasant way. It is drunk multiple times a day throughout Mongolia. Boortsog is generally referred to as a biscuit, but is more like a less-sweet, smaller version of an old-fashioned American doughnut. It goes well with sweet drinks, like milk tea, as well as savory soups and stews. This specialty treads the middle ground between sweet and salty so well that it makes an excellent snack any time of the day. A lamb stew that is cooked outdoors in a large pot alongside hot stones, khorkhog highlights the natural taste of the lamb because the stones absorb the meat's fat. I know what you're thinking: the fat's the best part! However, this leaner version provides a more gamey, earthy taste. It's usually served under a layer of vegetables. This noodle dish uses flour noodles (which you can make at home from tortillas), a meat (usually beef or mutton, but camel and horse are more commonly used than pork or chicken), and a vegetable medley that is heavy in leeks or onions. You can use broth for a deeper flavor, or just cook it in water. The result is a richer take on ramen. May 7 (Signed by Sez) When I found out four months ago that I would be spending a year living in Mongolia, five Michelin star dining was not the first image my brain went to. Unlike the Italians, the French or many of Mongolia's close Asian neighbours, Mongolian cuisine doesn't scream: "I'm delicious and known the world round, put copious amounts of me in your belly". If anything it quietly murmurs: "These are the ingredients we had to work with and this is the tastiest options we could come up with, enjoy!" The traditional Mongolian diet is meat, flour and dairy; an extension of their nomadic way of life. You milk your livestock, kill and eat them and then you use the grain supplies you have to make different kinds of bread products. Add water and combine all three into a range of different dishes. There is a low attendance of vegetable and a lack of seasonings enough to make the Indians shudder in their sleep. Although they are made these ingredients into different shapes and cooked in different methods, many remark that most Mongolian dishes all kinda. taste. the. same. But before your tummy turns to mourning and you get too depressed for me, there are a couple of upsides. The traditional Mongolian food I had while staying with a family in a ger in the countryside was actually really good. Sure it's more combinations of meat and carbs than Jamie Oliver could come up with, but the hospitality you receive while out there is absolutely second to none. There is never a shortage of food and although we offered, no one had to lift a finger. I felt privileged to be a part of their eating traditions and show my gratitude to a family sharing their sometimes meager offerings with foreign strangers they don't even know. If the countryside menu is half a page with nine different meat and flour combinations, the menu in Ulaanbaatar is a book filled with every cuisine you can imagine, and probably some you don't want to. (On that note, I had been warned about the chances of eating horse or brains or similar due to the impossible way to distinguish what is in some of the dishes we are served. At first wary, now I just close my eyes and put it down the hatch. Ignorance is bliss until the first bout of food poisoning hits. Touch wood!). When we first arrived in UB, we were carted around by Boggie and our in country management team every day on a full itinerary of apartment viewings, meetings and city tours. In amongst this was lunch and dinner every day at the full range of UB's finest establishments. After the first week or so my parents asked me my thoughts on the Mongolian food. I had to honestly tell them I hadn't had any….. but I could offer opinions on the Korean, Indian, Italian, Japanese and American we'd had…. After you get sick of the best hangout places (which won't be likely for me: hello regular!) there is always the option to cook and prepare food at home. However, it can make for an interesting outing to the shops. 1. None of the shops sell the same stuff. So once you find your favourite milk, yoghurt, muesli or tea and are happy; then you have to traipse around UB going to five separate places to get each of them. Never thought I would so grateful for the ubiquitous product range at home. 2. Refrigeration is a developing concept. There are fridges in the supermarket. Food products, including fresh meat, are put in them. Whether they are actually on is another story. We've hedged our bets on some refrigerated products and have decided not to be brave on others. My stomach thanks me. 3. It is definitely a motivator to learn more Mongolian. About half of the labels on products are in English; which means the other half is not. Sometimes you can tell by looking at it what it is, but after you've bought sour cream instead of normal cream three times, it can become a little frustrating. So in summary, no Mum I'm not starving. I'm eating my five veg (albeit five lots of the same veg as there isn't a huge amount of variety) and although some kinds cost more than alcohol, have been eating my fruit. Many have lamented on the lack of fresh fruits and vegetables and wondered how I'm surviving but when you are living in Mongolia it's not like Mongolia has a choice. In a completely landlocked country, relying on importation for virtually everything, the battle is sometimes like pushing water up a hill. But for now I'll sit here with the best I can do and enjoy the other 26 reasons why Mongolia is a great place. But for god sakes someone better be waiting at the airport with a pineapple when I arrive….